These are the echoes of this traditional chant which can be heard in the premises of Cognus Technology as the Cognus family is celebrating the splendid festival of Ganesh Chaturthi. 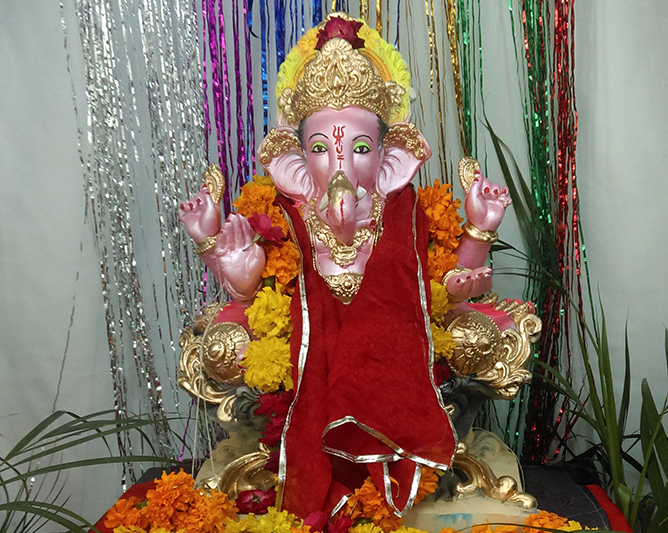 The zeal and fervor around the grand celebrations of Ganesh Chaturthi is wonderful throughout the office. Cognus believes that in such celebrations, employees bond with each other and also, it is a good chance to bring out their hidden talents. Such celebrations also build team spirit and collaboration among the co-workers, thus creating synergy. The idol of Ganesh Ji has been brought & placed in the embellished & divine corners of the office 9 days before the actual date of the festival. Every day begins with a group aarti and lighting of the lamps and aggarbattis by Cognusians. A basket of beautiful fresh flowers & Diyas are used to decorate the worshipping place. The environment seems blissful with the scented agarbattis and blessings of the almighty. On the last day of worship, the idol would be taken out by the employees in a vibrant and melodious procession to be immersed traditionally in the Lake. Here is Cognus Team wishing you all a Happy and Blessed Ganesh Chaturthi 2014!